In last articles we have seen about the software verification process and software validation process which plays a major role in software testing procedure. Now let’s come to another important topic, Capability maturity module. This module is used to find the maturity of any company’s software processes. How an organization is managing the software development process and which kind of methodology have been used by the company this all questions have been answered in CMM verification. We can say that it is the bench mark for the measuring about the company’s followed procedures. CMM have different levels for measuring the organization management. All CMM level have been measured by different key process area. In verification of CMM levels, it includes the projects and clients of the organization and how a company is dealing with them with and what kind of standard procedures have been followed for satisfaction of clients. CMMI Level Provides below details for identifying the organization’s perspective. How company takes benefit from their past experiences and incidents. How company user the communication channel, is same version and language have been used for development? We will understand each level in brief. 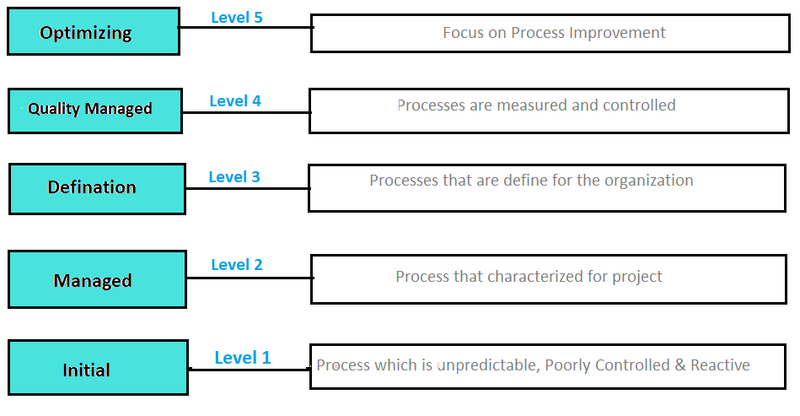 Each level have their own defined process which needs to be fulfilled in an organization then and only then that level have been passed through the CMMI verification. Some specific goal will be archived in CMMI verification process. As name define this is the initial stage. Here it can be define as, Company does not have specific procedures to develop a software or product. Even product tracking system have not been developed by organization so perfect coast of the product will not be defined and targeted finish date will not be declared. 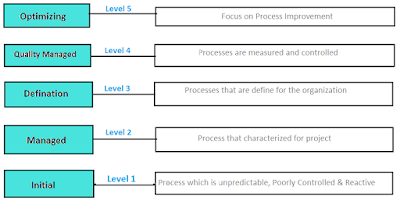 In level 1, process are planned as ad hoc. It means it does not proper environment for working and it does not have any stable procedure to follow. This kind of organization are still at their success level and they have earned very good profit without any standard procedures. They are continuously look into the competition ratio only. They don’t want to grow their organization with good manner. In this kind of Companies, They are developing many software products and application without any procedures and here developer have to decide the coast of the product and final date of the product without any accurate sheet. Everything is working with the prediction. As we understood, here past procedures are not going to be repeat for projects. Each time project have been assigned to the different people and they will lead the projects as per their perspective. This is all about the Level 1 of CMMI. Now let’s move to the next one. This is the second level of CMMI. In this level, Organization have installed basic soft wares for building the applications and decided the controls for manage the product but its consistency is not same within different group of organization. Here Company can give assurance that all requirements of the project will be fulfilled and development processes have been decided also at the early stage of project. Thus, a specific and generic goals have been achieved by the organization in Advance. This level is assist that existing process have been implemented at the time of deadlines and this process have been defined in the documented plan. This would help to each employee. All the Management procedures like, Requirement analysis, Process definition, Work on Products and Services etc. while developing the application, Development status have been sent to the managers on daily basis. This is the part of the Management. After developing the product or application, it would be presented in front of clients and as per their requirements, improvements have been noted. Thus, Products have been reviewed and controlled by the clients only. Here Product will meet all the requirements and then delivered to the clients. This is all about level 2 of CMMI. Further Level 3,4 & 5 is remaining. It will defined in next article.